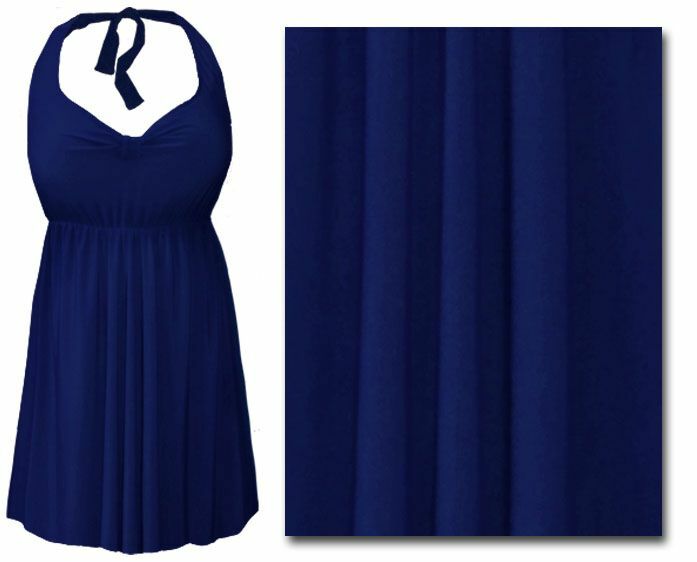 Halter top plus size & supersize swimsuit (swimdress), elastic at empire waist, extra roomy hips, and they come with either matching plain bottoms (bottoms are a separate piece, not connected) or plain swim shorts (for a little extra). There is a shelf bra inside, or you can wear your own bra with it (just take an old bra, unhook or cut the straps from the back, and tie them around your neck under the halter swimsuit). They're nice & long, and usually hit appx mid-thigh, but are available extra long as a special order. Very hard to measure, because these plus size & super size swim suits (swim dresses) should fit tight at the chest, there is a shelf bra inside, so for a limited time, we will give free re-shipping on size exchanges! Hips are extra-extra roomy, should fit even our most extreme pears! IMPORTANT! These are made to order, so they take approximately 4-7 working days before they will ship out from here! You can special order RUSH THEM as follows; on the 2-3 day rush, that means it will leave here within 2-3 working days (If you order it on Wednesday, it will leave here on or before the following Monday, etc. ), and then with the super rush, it will leave here within 1 business days (if you order it on Monday, it will leave here on or before Tuesday, if you order on Friday, it will leave here Monday, etc. ).